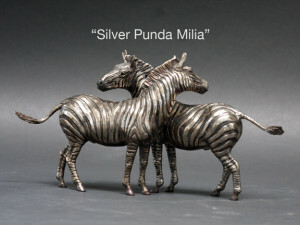 Swahili for zebra, punda milia literally means donkey with stripes. 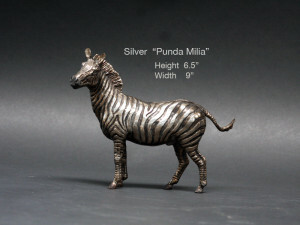 The zebra is the horse lover’s African favorite. The single zebra is a beautiful depiction in polished silver with a hint of black stripes. Since they are often seen standing in their familiy pods, heads crossing over each other’s backs keeping the flies away as horses do, these are nicely displayed as a pair. Also available in polished bronze. This entry was posted in AllPosts, Sculptures cast in .999 Fine Silver. Bookmark the permalink.